Good news for the Toshiba fans, today the company launched 3 new laptops in their Satellite category, more specifically the M200 and M205 series. There are two notebooks from the M200 series, and only one in the M205, which by coincidence is the less expensive with a price of $950. 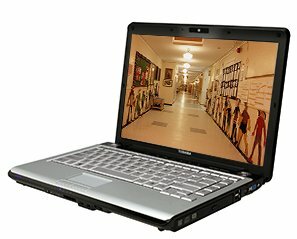 The latest Toshiba Satellite M205 model comes with an Intel Pentium T2080 dual-core processor running at 1.73Ghz, 1GB of RAM, a 160GB SATA hard-drive, and an integrated (943GML chipset) Graphics Media Accelerator 950. On the M200 series there are two models: ST2001 and ST2002, costing $1,000 and $1,179 respectively. The main difference between each is the processor, the hard drive, and the graphics card. While the first (ST2001) sports an Intel Core 2 Duo T5300 processor running at 1.73GHz, the second (ST2002) has an Intel Core 2 Duo T7100 processor, that gives a “speed” of 1.8GHz. The storage capacity difference is considerably large – 40GB – which means that while one has 160GB, the other comes with 200GB – both SATA hard-drives that have different rpms, 5,400 for the smaller drive, and 4,200 for the bigger one. The last notable difference is on the graphics section like I previously mentioned, one has the X3100 GMA, while the other features a GMA 950. As for other specifications like the screen and extra features, all models have a 14.1” widescreen with a built-in webcam, 4 USB ports, and a 5-in-1 card reader. Additionally, the M200 series have a fingerprint reader.